It's not that I get tired of eating traditional shabbat fare, but it is nice to change it up every so often. Tonight, I decided to stray from the usual, and make an Italian shabbat dinner. 1. Challah- bread machine again! I have made chicken marsala in the past, but it always turned out mediocre because I would use cooking marsala. I am so excited because I have a real bottle of kosher marsala wine for the first time ever. I can't wait to taste the results. I will post the results, and if it is good the recipe too. 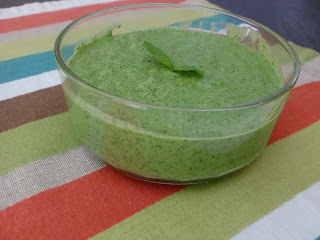 This pesto sauce would be great served on pasta, or toasted pieces of french bread, and salmon too. Preheat oven to 400 degrees. Pour half of the pesto into a small bowl and dip each piece of tilapia. Place the dipped tilapia on a sheet pan covered with parchment paper. Serve hot with more pesto sauce drizzled on top. In the bowl of a food processor, such as a Cuisinart, place the pine nuts, garlic, basil, and lemon juice. Pulse a few times, then run it while drizzling in the olive oil, keep processor on until the pesto is creamy. Add salt, taste to adjust salt. My sister Ashley and I argue who created this recipe. Ashley- this is my recipe!!! I measured out the ingredients and wrote it down as I made it this morning. I will give her some credit though because when she made it last week, she used sourdough bread for the croutons, and she gave me the idea to do just that in this recipe. Place the chopped romaine in a large bowl. Sprinkle on croutons, and pour over some of the salad dressing. Toss to coat, add more dressing if necessary, sprinkle on parmesan if using, and fresh cracked black pepper to taste. Serve immediately. Place bread cubes on a sheet pan and drizzle with olive oil, sprinkle with garlic salt, pepper, and paprika. Toss to coat all sides. Bake for 15-25 minutes until golden and crisp. Place all of the above ingredients into a jar with a lid. Screw lid on and shake until emulsified. These decadent treats are hot right now, I'm seeing them everywhere, even Starbucks. My son calls the ones at Starbucks popsicles because they are on a stick. This was my first try at making them. They were messy and labor intensive, but well worth it. I made these parve by using everything parve. Prepare the cake according to the package, I made mine in a 13x9 pan. When the cake comes out of the oven and is almost completely cool, crumble into a large bowl. Mix in the frosting until all the cake and frosting is completely combined, it will resemble a dough. Place this mixture back into the 13x9 pan, and place in refrigerator. Remove from refrigerator and with a melon baller scoop out cake and roll into a ball. Do this until there is none left. Place these balls back into the pan, and place into the freezer. Freezer for at least 2 hours. Melt the chocolate chips in a microwave safe bowl, in the microwave at 10 second intervals, stirring each time, until the chocolate is completely melted and smooth. Remove the balls from the freezer. 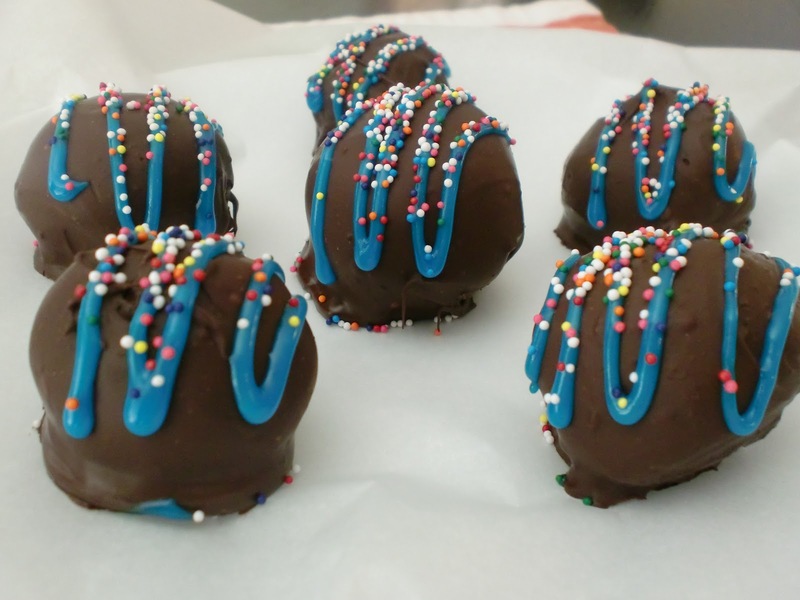 Dip each ball into the melted chocolate. Fish the ball out with a fork and place on a baking sheet covered with parchment. Repeat until all the balls have been coated. Drizzle the tops with the cookie icing, and sprinkle with sprinkles. Let the icing dry for 30 minutes. Then cover the balls and store in the refrigerator or freezer until ready to serve.